The Marienberg Cellar Door has just re-opened after refurbishment of the adjacent restaurant. 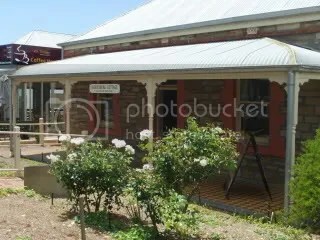 They have also moved the cellar door location onto the McLaren Vale Main Street. This looked like a smart move as previously the outlet was around the corner on Chalk Hill Road. I was looking forward to visiting the newest cellar door in the area, but that emotion was soon changed to “what am I doing here”. The cellar door is at the end of the restaurant and it looked like the dumping ground for the items needed to get away from the bar. There was dirty dishes and generally just stuff all around. Once directed to use the top of a wine barrel I was then treated to open bottles of wines that had no more than their stelvin caps on – no looking after the wine with oxygen removal options or wine shields. This made me wonder how long the wines were open and how fresh was the wine. You can see my comments below are not very complementary and I must say that I found my worst McLaren Vale cellar door. Straight away the wine showed aged chemical characters that were unpleasant. All the typical flavors of New Zealand Sauvignon Blanc – strong passionfruit and gooseberry aromas plus passionfruit flavours with an acidic citrus finish. The wine will probably sell well but for me – why have an overseas wine when we need to support the Australian wine industry. Not good – closed aromas with flavors that would be a mixture of cats pee with tropical juice. No way. Toasty, bitter oxidized aromas and flavors. Again, I could not drink this. The aromas started with some good mulberry fruit and has a smokiness on the finish. The flavors were dominated by fruit sweetness, smokey oak and some nice acid on the finish. There was a slight bitterness that drew you away from the wine – the alcohol on this wine was not high so the bitterness would be seen as a fault in the wine. I could not get any aromas from this wine, even though the bottle had been open before I arrived. The expected black fruits were here with a dusty tannin finish but nothing else. There was no lingering effect on the palate – once you have swallowed the wine there is no sensation left. Yet again, I cannot see why anybody would want to drink this. Aromas were black fruits with a meaty undertone that was concerning. Classical blackcurrent and cigar box characters with good acid levels and a strong finish. Clean and basic but not inspiring. This is down right nasty – porty and oxidised so just not right. I cannot believe this is classified as a Reserve wine. Keep your money. This was easily the best wine here – the aromas were hints of plum with lots of vanilla (from the American oak). The flavors here was real fruit sweetness with some American oak sweetness as well. The use of oak was much better here and the finish had a slight bitterness that was probably due to high alcohol levels. Drink this with something fatty (to take the edge away from the bitterness) such as bangers and mash (sausages and mashed potatoes). This was Ok but not as good as the above Shiraz. Here was a wine that had lots of plums and oak integration. It has fair components but just not inspiring enough for me to part with my money. This wine is just nasty – cannot believe this wine is marketed as a premium wine. Porty and oxidized like a number of the other red wines. This entry was posted in Mclaren Vale, wine and tagged Adelaide Hills, Australia, Australian wine, Cabernet Sauvignon, cellar door, Chardonnay, Mclaren Vale, Merlot, Sauvignon Blanc, Shiraz, Viognier. Bookmark the permalink. Thanks for the review mate, I know where your coming from with the reviews, but could you be so kind in coming in and expressing your thoughts with my Mum (Carmel Sullivan) and her parnter ( Roger Andrews). If you would like to drop in some time and let us know of your thoughts so we can then take this information to WIne National, as we want this Cellar Door to be a icon for Mclaren Vale with the lime stone cottage’s history and also the wine’s history.